The Boston Massacre, known as the Incident on King Street by the British, was an incident on March 5, 1770, in which British Army soldiers killed five male civilians and injured six others. British troops had been stationed in Boston, capital of the Province of Massachusetts Bay, since 1768 in order to protect and support crown-appointed colonial officials attempting to enforce unpopular Parliamentary legislation. Amid ongoing tense relations between the population and the soldiers, a mob formed around a British sentry, who was subjected to verbal abuse and harassment. He was eventually supported by eight additional soldiers, who were subjected to verbal threats and thrown objects. They fired into the crowd, without orders, instantly killing three people and wounding others. Two more people died later of wounds sustained in the incident. The crowd eventually dispersed after Acting Governor Thomas Hutchinson promised an inquiry, but reformed the next day, prompting the withdrawal of the troops to Castle Island. Eight soldiers, one officer, and four civilians were arrested and charged with murder. Defended by the lawyer and future American President, John Adams, six of the soldiers were acquitted, while the other two were convicted of manslaughter and given reduced sentences. The men found guilty of manslaughter were sentenced to branding on their hand. Depictions, reports, and propaganda about the event, notably the colored engraving produced by Paul Revere (shown at right), further heightened tensions throughout the Thirteen Colonies. Boston, the capital of the Province of Massachusetts Bay and an important shipping town, was a major center of resistance to unpopular acts of taxation by the British Parliament in the 1760s. In 1768, the Townshend Acts were placed upon the colonists, by which a variety of common items that were manufactured in Britain and exported to the colonies were subjected to import tariffs. Colonists objected that the Townshend Acts were a violation of the natural, charter, and constitutional rights of British subjects in the colonies. The Massachusetts House of Representatives began a campaign against the Townshend Acts by sending a petition to King George III asking for the repeal of the Townshend Revenue Act. The House also sent what became known as the Massachusetts Circular Letter to other colonial assemblies, asking them to join the resistance movement, and called for a boycott of merchants importing the affected goods. In Great Britain, Lord Hillsborough, who had recently been appointed to the newly created office of Colonial Secretary, was alarmed by the actions of the Massachusetts House. In April 1768 he sent a letter to the colonial governors in America, instructing them to dissolve the colonial assemblies if they responded to the Massachusetts Circular Letter. He also ordered Massachusetts Governor Francis Bernard to direct the Massachusetts House to rescind the letter. The house refused to comply. Boston’s chief customs officer, Charles Paxton, wrote to Hillsborough, asking for military support because “the Government is as much in the hands of the people as it was in the time of the Stamp Act.” Commodore Samuel Hood responded by sending the fifty-gun warship HMS Romney, which arrived in Boston Harbor in May 1768. On June 10, 1768, customs officials seized the Liberty, a sloop owned by leading Boston merchant John Hancock, on allegations that the ship had been involved in smuggling. Bostonians, already angry because the captain of the Romney had been impressing local sailors, began to riot. Customs officials fled to Castle William for protection. Given the unstable state of affairs in Massachusetts, Hillsborough instructed General Thomas Gage, Commander-in-Chief, North America, to send “such Force as You shall think necessary to Boston”. On October 1, 1768, the first of four British Army regiments began disembarking in Boston. Two regiments were removed from Boston in 1769, but the 14th and the 29th Regiments of Foot remained. The Journal of Occurrences, an anonymously written series of newspaper articles, chronicled clashes between civilians and soldiers while troops were stationed in Boston, feeding tensions with its sometimes exaggerated accounts of the events. Tensions rose markedly after Christopher Seider, “a young lad about eleven Years of Age”, was killed by a customs employee on February 22, 1770. Seider’s death was glorified in the Boston Gazette, and his funeral was described as one of the largest of the time in Boston. The killing and subsequent propaganda inflamed tensions, with gangs of colonists looking for soldiers to harass, and soldiers also on occasion looking for confrontation. As the evening progressed, the crowd around Private White grew larger and more boisterous. Church bells were rung, which usually signified a fire, bringing more people out. Over fifty Bostonians pressed around White, led by a mixed-race runaway slave named Crispus Attucks, throwing objects at the sentry and challenging him to fire his weapon. White, who had taken up a somewhat safer position on the steps of the Custom House, sought assistance. Runners alerted the nearby barracks and Captain Thomas Preston, the officer of the watch. According to his report, Preston dispatched a non-commissioned officer and six privates of the 29th Regiment of Foot, with fixed bayonets, to relieve White. The soldiers Preston sent were Corporal William Wemms, Hugh Montgomery, John Carroll, William McCauley, William Warren, and Matthew Kilroy. Accompanied by Preston, they pushed their way through the crowd. En route, Henry Knox, again trying to reduce tensions, warned Preston, “For God’s sake, take care of your men. If they fire, you must die.” Captain Preston responded “I am aware of it.” When they reached Private White on the custom house stairs, the soldiers loaded their muskets, and arrayed themselves in a semicircular formation. Preston shouted at the crowd, estimated to number between three and four hundred, to disperse. The crowd continued to press around the soldiers, taunting them by yelling, “Fire!”, by spitting at and throwing snowballs and other small objects at them. Richard Palmes, a local innkeeper who was carrying a cudgel (i.e., club), came up to Preston and asked if the soldiers’ weapons were loaded. Preston assured him they were, but that they would not fire unless he ordered it, and (according to his own deposition) that he was unlikely to do so, since he was standing in front of them. A thrown object then struck Private Montgomery, knocking him down and causing him to drop his musket. He recovered his weapon, and was thought to angrily shout “Damn you, fire!”, then discharged it into the crowd although no command was given. Palmes swung his cudgel first at Montgomery, hitting his arm, and then at Preston. He narrowly missed Preston’s head, striking him on the arm instead. There was a pause of uncertain length (eyewitness estimates ranged from several seconds to two minutes), after which the soldiers fired into the crowd. Rather than a disciplined volley (Preston gave no orders to fire), a ragged series of shots was fired, which hit eleven men. Three Americans—ropemaker Samuel Gray, mariner James Caldwell, and Crispus Attucks—died instantly. Samuel Maverick, an apprentice ivory turner of seventeen, was struck by a ricocheting musket ball at the back of the crowd, and died a few hours later, in the early morning of the next day. An Irish immigrant, Patrick Carr, died two weeks later. Christopher Monk, another apprentice, was one of those seriously wounded in the attack. Although he recovered to some extent, he was crippled and eventually died in 1780, purportedly due to the injuries he had sustained in the attack a decade earlier. The crowd moved away from the immediate area of the custom house, but continued to grow in nearby streets. Captain Preston immediately called out most of the 29th Regiment, which adopted defensive positions in front of the state house. Acting Governor Thomas Hutchinson was summoned to the scene, and was forced by the movement of the crowd into the council chamber of the state house. From its balcony he was able to minimally restore order, promising there would be a fair inquiry into the shootings if the crowd dispersed. Hutchinson immediately began investigating the affair, and by morning, Preston and the eight soldiers had been arrested. In a meeting of the governor’s council held late the morning after the shootings, Boston’s selectmen asked Hutchinson to order the removal of troops from the city to Castle William on Castle Island, while a town meeting at Faneuil Hall met to discuss the affair. The governor’s council was at first opposed to ordering the troop withdrawal, with Hutchinson correctly claiming he did not have the authority to order the troops to move. Lieutenant Colonel William Dalrymple, commander of the troops, did not offer to move them. The town meeting, however, became more restive when it learned of this. Under an imminent threat of further violence, the council changed its position, and unanimously (“under duress”, according to Hutchinson’s report) agreed to request the troops’ removal. Secretary of State Andrew Oliver reported that, had the troops not been removed, “that they would probably be destroyed by the people — should it be called rebellion, should it incur the loss of our charter, or be the consequence what it would.” This decision left the governor without effective means to police the town. The 14th was transferred to Castle Island without incident about a week later, with the 29th following shortly after. The first four victims were buried amid great ceremony on March 8; Patrick Carr, the fifth and final victim, died on March 14 and was buried with them on March 17. Mr. John Gillespie, in his deposition, (No. 104) declares that, as he was going to the south end of the town, to meet some friends at a public house, he met several people in the streets in parties [armed with clubs], to the number, as he thinks, of forty or fifty persons; and that while he was sitting with his friends there, several persons of his acquaintance came in to them at different times, and took notice of the numbers of persons they had seen in the street armed in the above manner. […] About half an hour after eight the bells rung, which [Gillespie] and his company took to be for fire; but they were told by the landlord of the house that it was to collect the mob. Mr. Gillespie upon this resolved to go home, and in his way met numbers of people who were running past him, of whom many were armed with clubs and sticks, and some with other weapons. At the same time a number of people passed by him with two fire-engines, as if there had been a fire in the town. But they were soon told that there was no fire, but that the people were going to fight the soldiers, upon which they immediately quitted the fire-engines, and swore they would go to their assistance. All this happened before the soldiers near the custom-house fired their muskets, which was not till half an hour after nine o’clock; and it [shows] that the inhabitants had formed, and were preparing to execute, a design of attacking the soldiers on that evening. On March 27 the eight soldiers, Captain Preston, and four civilians who were in the Customs House and were alleged to have fired shots, were all indicted for murder. Bostonians continued to be hostile to the troops and their dependents. General Gage, convinced the troops were doing more harm than good, ordered the 29th Regiment out of the province in May. Governor Hutchinson took advantage of the ongoing high tensions to orchestrate delays of the trials until later in the year. In the days and weeks following the incident, a propaganda battle was waged between Boston’s radicals and supporters of the government. Both sides published pamphlets that told strikingly different stories, which were principally published in London in a bid to influence opinion there. The Boston Gazette’s version of events, for example, characterized the massacre as part of an ongoing scheme to “quell a Spirit of Liberty”, and harped on the negative consequences of quartering troops in the city. A young Boston artist, Henry Pelham, half-brother of the celebrated portrait painter John Singleton Copley, depicted the event. Silversmith and engraver Paul Revere closely copied Pelham’s image, and is often credited as its originator. In order to further public outrage, the engraving contained several inflammatory details. Captain Preston is shown ordering his men to fire, and a musket is seen shooting out of the window of the customs office, which is labeled “Butcher’s Hall.” Artist Christian Remick hand-colored some prints. Some copies of the print show a man with two chest wounds and a somewhat darker face, matching descriptions of attacks; others show no victim as a person of color. The image was published in the Boston Gazette, circulating widely, and became an effective piece of anti-British propaganda. The image of bright red “lobster backs” and wounded men with red blood was hung in farmhouses across New England. Anonymous pamphlets were published describing the event from significantly different perspectives. A Short Narrative of the Horrid Massacre, published under the auspices of the Boston town meeting, was principally written by James Bowdoin, a member of the governor’s council and a vocal opponent of British colonial policy, along with Samuel Pemberton, and Joseph Warren. It described the shooting and other lesser incidents that took place in the days before as unprovoked attacks on peaceful, law-abiding inhabitants, and was, according to historian Neal Langley York, probably the most influential description of the event. The account it provided was drawn from more than 90 depositions taken after the event, and it included accusations that the soldiers sent by Captain Preston had been deployed with the intention of causing harm. In the interest of minimizing impact on the jury pool, city leaders held back local distribution of the pamphlet, but sent copies to other colonies and to London, where they knew depositions collected by Governor Hutchinson were en route. A second pamphlet, Additional Observations on the Short Narrative, furthered the attack on crown officials by complaining that customs officials (one of whom had left Boston to carry Hutchinson’s gathered depositions to London) were abandoning their posts under the pretense that it was too dangerous for them to do their duties. The depositions that Hutchinson collected and sent to London were eventually published in a pamphlet entitled A Fair Account of the Late Unhappy Disturbance in Boston. Drawn mainly from depositions by soldiers, its account of affairs sought to blame selfish Bostonians for denying the validity of Parliamentary laws. It also blamed the city’s hoodlums and gangs for the lawlessness preceding the event, and claimed that they set up an ambush of the soldiers. However, as it was not published until well after the first pamphlet had arrived in London, it ended up having a much smaller impact on the public debate there. The government was determined to give the soldiers a fair trial so there could be no grounds for retaliation from the British and so that moderates would not be alienated from the Patriot cause. After several lawyers with Loyalist leanings refused to defend Preston, he sent a request to John Adams, pleading for him to work on the case. Adams, who was already a leading Patriot and who was contemplating a run for public office, agreed to help, in the interest of ensuring a fair trial. Adams was joined by Josiah Quincy II after the latter was assured that the Sons of Liberty would not oppose his appointment, and by Robert Auchmuty, a Loyalist. They were assisted by Sampson Salter Blowers, whose chief duty was to investigate the jury pool, and Paul Revere, who drew a detailed map of the bodies to be used in the trial of the British soldiers held responsible. Massachusetts Solicitor General Samuel Quincy and private attorney Robert Treat Paine, hired by the town of Boston, handled the prosecution. Preston was tried separately in late October 1770. He was acquitted after the jury was convinced that he had not ordered the troops to fire. The trial of the eight soldiers opened on November 27, 1770. Adams told the jury to look beyond the fact the soldiers were British. He argued that if the soldiers were endangered by the mob, which he called “a motley rabble of saucy boys, negroes, and molattoes, Irish teagues and outlandish jack tarrs [i.e. sailors]”, they had the legal right to fight back, and so were innocent. If they were provoked but not endangered, he argued, they were at most guilty of manslaughter. The jury agreed with Adams and acquitted six of the soldiers after two and one-half hours deliberation. Two of the soldiers were found guilty of manslaughter because there was overwhelming evidence that they had fired directly into the crowd. The jury’s decisions suggest that they believed the soldiers had felt threatened by the crowd, but should have delayed firing. Patrick Carr, the fifth victim, corroborated this with deathbed testimony delivered to his doctor. The convicted soldiers were granted reduced sentences by invoking Benefit of clergy, which reduced their punishment from a death sentence to branding of the thumb in open court. The four civilians were tried on December 13. The principal prosecution witness, a servant of one of the accused, made claims that were easily rebutted by defense witnesses. In the face of this weak testimony, as well as waning public interest, the prosecution allegedly failed to press its case very hard. The civilians were all acquitted, and the servant was eventually convicted of perjury, whipped, and banished from the province. 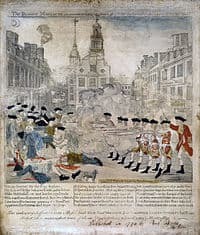 The Boston Massacre is considered one of the most important events that turned colonial sentiment against King George III and British Parliamentary authority. John Adams wrote that the “foundation of American independence was laid” on March 5, 1770, and Samuel Adams and other Patriots used annual commemorations (Massacre Day) of the event to fulminate against British rule. Christopher Monk, the boy who was wounded in the attack and died in 1780, was paraded before the crowds as a reminder of British hostility. Later events such as the Boston Tea Party further illustrated the crumbling relationship between Britain and its colonies. Although five years passed between the massacre and outright revolution, and direct connections between the massacre and the later war are (according to historian Neil Langley York) somewhat tenuous, it is widely perceived as a significant event leading to the violent rebellion that followed. The massacre was remembered in 1858 in a celebration organized by William Cooper Nell, an African American abolitionist who saw the death of Crispus Attucks as an opportunity to demonstrate the role of African Americans in the Revolutionary War. In part of because of this activism, artwork commemorating the massacre was produced that changed the color of a victim’s skin to black (which in Revere’s original engraving was white) to emphasize Attucks’ claimed martyrdom. In 1888, a monument was erected on the Boston Common to the men killed in the massacre, and the five victims, along with Christopher Seider, were reinterred in a prominent grave in the Granary Burying Ground. The massacre is reenacted annually on March 5 under the auspices of the Bostonian Society. The Old State House, the massacre site, and the Granary Burying Ground are all part of Boston’s Freedom Trail, connecting sites important in the city’s revolutionary-era history.